Last Friday, I posted my poem The Newspaper, and talked about whether a poem can become dated or vene outdated. And I asked readers which ‘old’ poems they still connect with. I had such pleasure from the responses that I thought I’d share some of them this week. “The past is a foreign country; they do things differently there. This quote itself could spark a whole new topic: that of wonderful opening lines. But I’ll try to stay on-topic here. Michelle and Jama both agree that some poems, and poetic forms, do become dated but, Jama adds, “the truth in words of human experience, crafted with care and attention, are forever”. Other commenters shared their favourite ‘old’ poems, from Little Orphant Annie (a favourite of Linda), to Chaucer (Kay‘s go-to). Brenda holds the “red wheel/ barrow” of William Carlos Williams close to her heart, and Michelle has always loved The Owl and the Pussycat. Donna, like me, was (and still is) a big fan of R.L. Stevenson, like me. .., I don’t want to let go of poems or much from the past in terms of literature. It may be outdated but it’s a part of me. And your post inspired a poem (below)! Thanks! Thanks Penny both for responding in poetry and for allowing me to use your poem in a new poem. And thanks to everyone who shared in the discussion. This week’s poetry Friday roundup is on the Rain City Librarian blog, where Jane is hosting for the first time. Pop over there to check out more poetry goodness around the internet this beautiful Friday. Who knows, you might find a new poem to hoard. What a fascinating blog post I missed last week. Lovely to get a catch-up with this one. And what a fabulous poem you inspired Penny with. Thanks Kat, and thanks for visiting. If I were going to be a hoarder, that is the kind of hoarder I would be. Penny has nailed it. What a great follow up, Sally. I love that you wove our responses together to take another look at the subject through the hive brain. Thanks Brenda. It’s certainly a topic that has us all talking – and smiling at shared memories. Beautiful continuity you’ve created Sally from last weeks post to this week, and what fun to have them all gathered together! I like Penny’s idea and poem of being a “poem hoarder—” if I was to hoard anything poetry would be on the top of my list. Thanks! Thank YOU Michelle. I work hard at not being a hoarder, but poetry hoarding seems a valuable past time. Wow — what a perfect response from Penny. I agree. There are certain older poems that we hoard, for a variety of reasons. I love “The Love Song of Hiawatha” because my father used to recite lines to us when I was small. And he knew it because of the old (sadly, lost) practice of memorizing poetry in school.. I so wish that memorising poetry was still valued. I was at the tail-end of that and so did memorise a handful of poems (mostly as performance items). And yes, I have often cited quoted these. Thanks for collecting the thoughts and comments, Sally. What a great conversation! And thanks for sharing my poem. thank YOU Penny for being so willing to share and for letting me repeat the poem. Penny’s poem is one I will add to my “hoard”, Sally. I love that you collected from the recent post, and that Penny responded, too. I have poems in folders, in envelopes, in online bookmarks. . . Sometimes I just reach in and pull one out, love what I find all over again. Thanks for a wonderful post today, and thanks to Penny too! Your new background is so full of life, beautiful! Thanks Linda. My daughter helped me bring together my vision of the photo, taken by my friend Jan,against the starry background. So a true joint effort. And yes, Penny’s poem is truly worthy of hoarding. May we all be poem hoarders! Penny’s response is perfect, and I’m so glad you shared the contributions to last week’s discussions. This is such a rich community–rich in poems, in thought, in warmth. Thanks Kay. 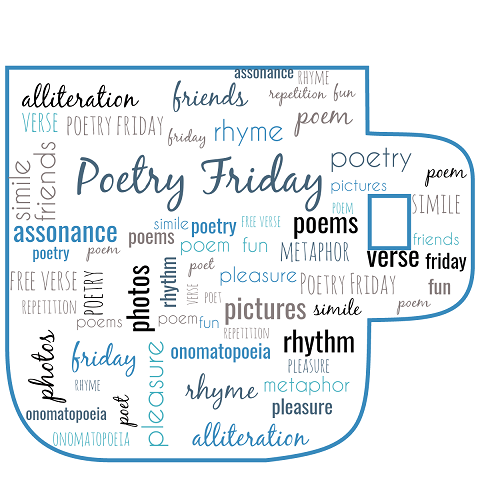 I love the Poetry Friday community so much! Too clever! I love your headline, Jan.
I’m sad to say that I missed this entire discussion as I was out for a couple of weeks. But, what a great topic. I would so love for all of us to be face to face to talk this over. Many of the poems mentioned above are favorites of mine. I grew up in a poetry poor environment. I had some poetry in school and started jotting down my own around age ten or so….but didn’t really get poetry specific readings unless it was part of a picture book (which does count!). I have a wonderful, wonderful memory of a book that we called, “Baby Baa” that was lyrical. That rhythm and rhyme made such an impression on me. I love your new blog background. It’s beautiful…and it pairs SO nicely with Tabatha’s blog post today. Thanks for visiting, Linda. Wouldn’t it be wonderful to sit down face to face and just talk poetry! Sorry to hear you lived in a ‘poetry poor’ environment – but what a poetic term for it. Pretty sure you’ve made up for lost time. Thanks for the comment re the background. I had my daughter create using a purchased background and a photo a friend took of me at a book event. I like the new background, Sally! Awesome to have a poem from Penny in response to your last post. I have an email folder of poems I’ve been saving, and your post made me wonder how many I’ve kept… 2456! Thanks Tabatha. I’ve been wanting to update the background for a while, and it just went live today. Glad you like it. 2456 is certainly enough to qualify you as poem hoarder, lol. The notion of being a poem hoarder is one I can relate too so easily Sally. I started collecting them in my poet’s suitcase until it overflowed. Sometimes I hide them inside other books and hope someone may stumble upon them on some future date. Favourite poems are like favourite songs. Snatches of lines and lyrics come floating by reminding us of their continuing existence and we regularly attach them to memories of time and place. Every time I think of Walter de la Mare’s poem ‘Five Eyes’ I am back in primary school listening to Mr Harris reading to the class.The words are ageless, because they are so beautifully put together. I believe great poems are ‘made.’ Made with time and love and persistence. I love Penny’s poem. It sums up this delicious addiction we all share. Thanks for sharing such insights. Thanks for visiting Alan. I love the idea of hiding poems where people might stumble on them. Great idea. I ofetn surprise msyelf with snatches of poetry I didn’t know were stored away in the recesses of my brain.